Courtesy of Heinz UK (Facebook). The company first announced this concoction on April 1, but it was no April Fools' joke. Well, Heinz was really revolutionizing the mayo world in the past few months, introducing Mayochup, Mayomust, and Mayocue. It's so drunk on power that it has now added Kranch to its product line, a ketchup-ranch blend that many people were dying for (I guess). And then Heinz had to go and ruin everything. 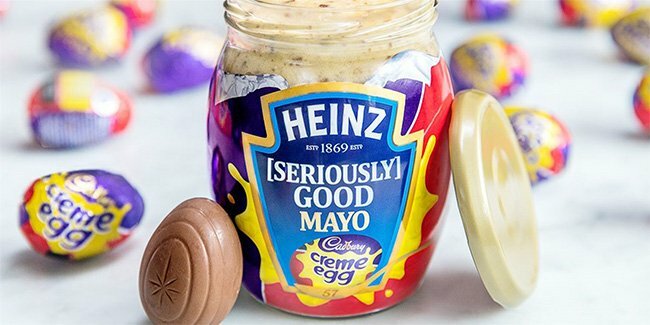 On April Fools' Day, the condiment company announced it would be bringing us a new creation that would blow our minds: Cadbury Creme Egg Mayo. We all had a good laugh and probably gave Heinz some props for coming up with such a clever prank. But, by April 2, we all learned it was no joke -- the mad scientists at the company were going to go Frankenstein and create a monster just in time for Easter. The sauce is apparently made from Heinz Mayo with Cadbury Creme egg fondant and chocolate. Part of me feels that would be stomach-churning, but the other part of me remembers that people use mayonnaise in some chocolate cake recipes, so maybe it's not that bad? Unfortunately (or fortunately), we won't have a chance to try it -- this sweet mayo nightmare was rolled out in the United Kingdom for a very limited time (April 11-13 to be exact, at specific locations). It is apparently part of Heinz's 150th-anniversary celebration. I wonder how those original Heinz founders would feel about this? Apparently, this concoction is meant to dollop on waffles and crumpets, and Heinz is pretty proud of it, saying in a release that the spread was created "in a moment of taste bud-tingling brilliance. A true taste sensation! If everyone loves it as much as we do, then who knows, we might have to roll it out nationwide one day." If Heinz brings this to the states, will you give it a shot? What other flavors should Heinz take on?